Videogame movies get a bad rap, but the people making the Just Cause film think that's because the writers and directors don't take the subject matter seriously. You can count the number of good films that are based on videogames on one hand (maybe even one finger if you're extemely critical.) That's partly the fault of Uwe Boll's monstrosities, but Adrian Askarieh and Eric Eisner, producers of the upcoming film based on the Just Cause series of games from Eidos Interactive. The main character of Just Cause is Rico Rodriguez, aka The Scorpion, and he's basically a cross between James Bond and Antonio Banderas' character in Desperado. Askarieh and Eisner believe that the combination of a strong central character and great action will set the Just Cause film above other videogame movies. "It's a great action/adventure with a strong central character," said Askariah. "Two must have elements for a good action film." "The epic scope of the games and the Scorpion character is what fascinated me," Eisner said of why he wanted to work on the movie. "I felt that we had the building blocks to make a very good action film and one that could hopefully translate into a franchise." But what about the bad track record that videogame movies have so far had? "I think what tends to hamper some videogame adaptations is that the people making those films are consciously aware that they are making 'videogame movies.' What is needed is for the filmmakers to treat the source material with as much gravity as one would a bestselling novel or any other source material. You have to take it seriously," Askariah said. It is also important to not fall into the trap of trying to recreate the game experience on the silver screen, something that Eisner is well aware of. "My philosophy has always been that you need to do the right thing for the film," he said. "The videogames have already been made and they are great. But you can't deliver the same experience to the audience; otherwise they should just sit at home and play the games. You need to be true to the DNA and spirit of the game but create a film that works on its own merits." 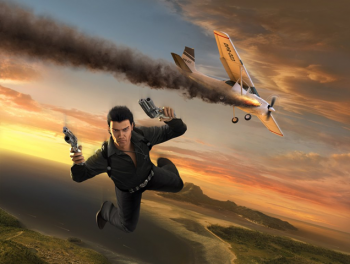 While I didn't find the story of Just Cause 2 very compelling when I played it, I could somehow see a film adaptation working as a great action flick. The concept that the as yet untitled film will serve as an origin story for Rico. It seems like Eisner and Askarieh are in the right head place to finally pull off a decent videogame adaptation.